McHenry, Maryland — Students attending the eleventh annual Mid-Atlantic Wildfire Training Academy at Garrett College took a break from their studies last evening for a barbecue dinner, hosted by the Academy. 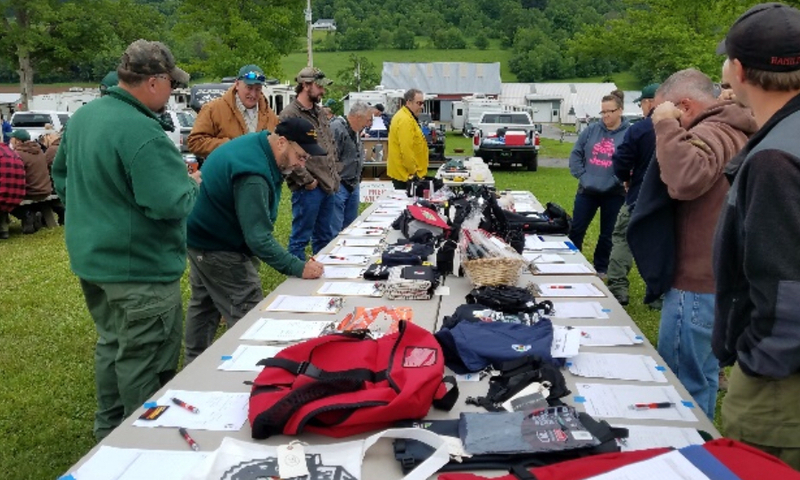 ​At the academy-wide dinner, students, instructors and staff bid on donated items at the silent and live auctions and purchased raffle tickets. The funds collected totaled over $3,000, which will be sent to the Wildland Firefighter Foundation. The Wildland Firefighter Foundation supports families with immediate financial needs after a firefighter fatality or injury. The Foundation can fly family members to the bedside of the injured, who are often states away from where they live. The Foundation also offers long term grief recovery for those families. ​Mr. John Berst was recognized for his continued support as the Mid-Atlantic Forest Fire Compact Coordinator. ​​The 2018 Mid-Atlantic Wildfire Training Academy is presented by the Mid-Atlantic Forest Fire Compact, Maryland Department of Natural Resources and the U.S. Forest Serviceand concludes on Friday, June 8th.